Yesterday news broke that Hilton is making changes to their reward program. First off, the name gets a slight change, they are doing away with the second H in HHonors so the program is now known as Hilton Honors. Not big but definitely makes Auto Correct correct now. The other changes are more profound with award categories going the way of the dodo, fixed points+cash moving to variable points+cash, points pooling and several other changes. 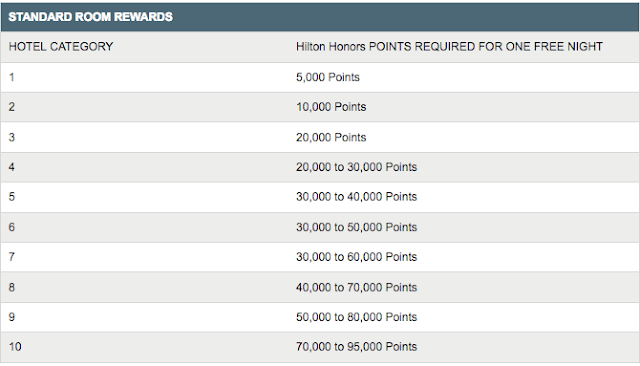 The Hilton Honors award chart we are all used to is going away. Rewards will be priced dynamically based on demand, cash rate for the room and more. Hilton claims that awards for standard rooms won't eclipse the maximum that was in the chart when these changes come into play later this month. Depending on when and what hotel you book you may actually pay less in points for that award night with the new dynamic pricing. You can get an idea of what hotels will cost with this page on the Honors site. Similar to airline point and money redemption rather than other hotel points plus cash options, Hilton Honors will have a slider allowing you to redeem variable amounts of points and cash for a stay. This is really good for those who may not earn enough points with Hilton to redeem for a full night but want to get rid of a few thousand points that may be sitting in your account. You'll be able to share/pool points with up to 10 family members or friends. Now is the time to get everyone in your family signed up for E-Rewards surveys so you can redeem for HHonors points and them funnel them into one account! You'll be able to use points to shop at Amazon.com. Not sure if it will work for us Canadians yet, presumably it will if that seller or product qualifies for shipping to Canada. If you have held Diamond Status for three years and have 250 nights or have accumulated 500,000 points you can request a one-time no questions asked extension to your Diamond Status if you don't requalify.